SGS has never seen before amalgamation activities present all under on roof. Its once in a life time opportunity to persue these activities on a daily basis. Professional coaches who are all National Players. National standard training program in each activity. Numerous Sanskrutians gain entry into National sports schools every year. Everyday 2:30 pm - 4:00 pm. Its a colourful feast to see the Sanskrutians cheering for their houses when they battle it out in the Horse Races, Swimming contests, Archery and Riffle Shooting competitions for the inter house trophy. 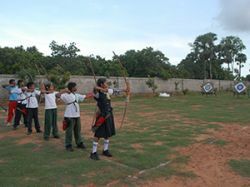 Sanskruthi Global School Sports facilities include a well maintained swimming poola basketball court, Horses for riding classes, shooting and Archery. Moreover this is the only school in Visakhapatnam to have Horse riding activity. There is also a special playground designed for students of the pre-primary section. Activity on Playfield develops the qualities of teamwork, leadership, dedication, discipline, self- confidence and self - esteem. These qualities get ingrained in the psyche and enable each student to overcome the trials and tribulations of life. Sports equip students to face challenges of an increasingly competitive world. All Sanskrutians are encouraged to take part in sports activities of their choice.